View a sample of our residential projects below. Click on an image to enlarge and show more detail. Project description: Extremely complicated 23 acre site. Ridgeline location and steep slopes provided both unique opportunities and difficulties. A quarter mile, engineered road ribbons up the hill to the house location, which enjoys unimpeded views from San Francisco to San Jose. As the house steps up the steep slope, each rooftop becomes a usable deck for the indoor space adjacent to it. This Santa Barbara style, Spanish revival home includes many details from the Santa Barbara architectural museum/archives that were researched by the owners. Tiles include reproductions of the original Catalina tile company. The interior includes a two and a half story circular stair case with a separate observation viewing area to San Francisco. Open beamed ceilings, plastered fireplaces, traditional floor tiles and an abundance of natural light all added to the ambiance. Home includes 4 bedroom, 4.5 bath, an office, a crafts room, a recreation room and a 3 car garage with a carport. Wonderful lot with both hillside and bay views. Great use of materials and details. Separate Guest House. Home includes 4 bedroom, 4.5 baths, a media room, a wine cellar, a 4 Car garage with porte cochere and a separate 1 bedroom and 1 bath guesthouse. This English country cottage made extensive use of imported materials and original detailing. The unique u-shaped design of the home allowed the sloping site to be used to the fullest. Outdoor fireplace and pool area make outdoor entertaining easy. Project description: This remodeled home sits in a neighborhood whose home designs are all reminiscent of the colonial style. This remodel included combining existing hallway, breakfast nook and storage area into a larger, more functional kitchen/breakfast area. Upstairs additions include expanded master suit, small office and new bedroom suit. Exterior changes include the addition of a large covered porch, which overlooks the swimming pool and multiple bowed windows. Home now has 5 bedroom, 4 baths, a small office and a 2 car garage. Project description: This extensive remodel made use of classical Mediterranean elements with a modern twist. The dominant arched front entry leads into the round, domed greeting area ringed with Doric columns, inlaid mosaic floors and walls and unique lighting features that add drama to the mural painted ceiling. 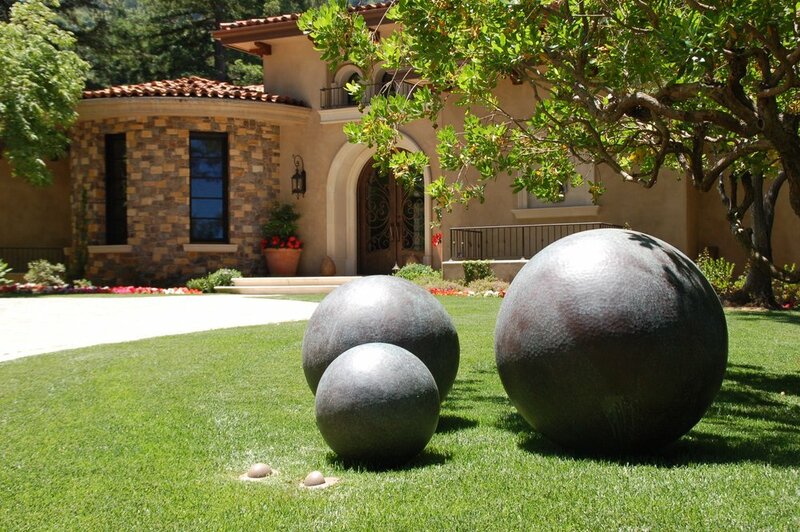 Special detailing throughout the home anticipated the owner’s artwork and statuary. Extensive floor and ceiling moldings, tile and hardwood floors and the cabinetry tie the style of the home together. A beautiful curved, rod iron stair case leads up to the guest room and recreation area with kitchenette and bar area, whichwere specifically placed upstairs to take advantage of extensive bay views. Rooftop outdoor patio boasts gorgeous fireplace and staircase down to pool and barbeque area. This unique arrangement creates the opportunity to entertain on multiple levels of the home at the same time. 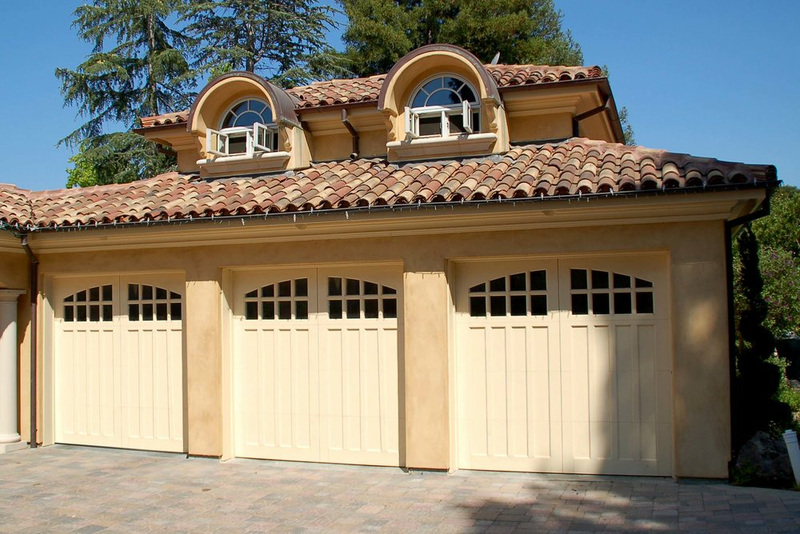 Garage is separate, but connected with arched breezeway. Separate Au Pair quarters are located above the 3 car garage. Home includes 5 bedroom, 3.5 baths, separate office and separate Au Pair quarters. This home is located on a very steep site. Special attention was paid to site planning in order to integrate the home into the hillside and preserve approximately 15 one-hundred-plus year-old redwood trees. Home includes 5 bedrooms, 6.5 baths, a private office, a media room, an exercise room, a billiards room, a wine cellar and a bar. Extensive use of unique materials and finishes throughout the home set this home apart from many others. Materials and finishes include solid bronze windows and doors, imported tiles, interior plaster/glazing and other amenities that cannot be disclosed. 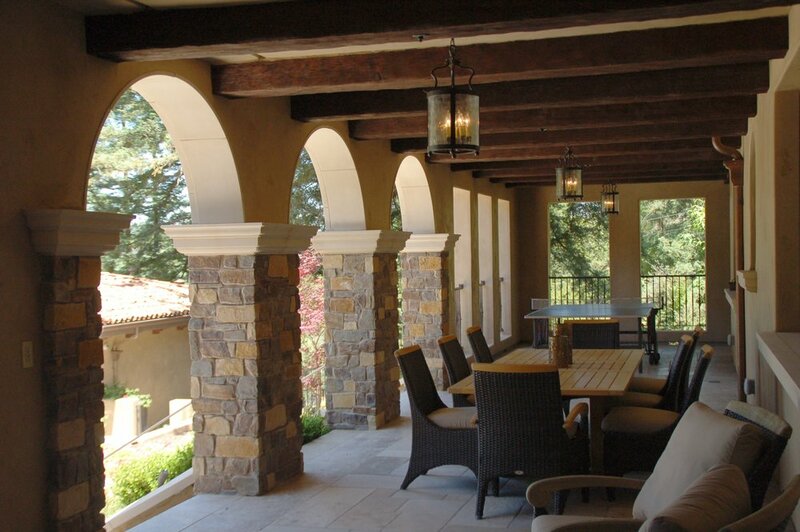 Outdoor features include dramatic stone archways, large covered porches and graceful staircases. Landscape areas include a vanishing edge pool and pool house and the relocation of 30 plus mature specimen trees. Separate 4 car garage includes an additional 4 car basement with automobile elevator.